The Frank warriors, or as they were also known Frankish warriors were the battle savvy, and proud Germanic tribe that eventually become the founders of the country of France. 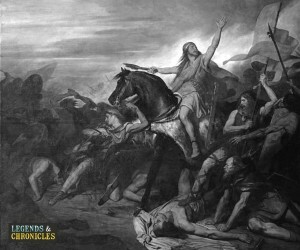 The Franks were a powerful tribe even among the strong and bristling Germanic tribes of the time, and were often reported to be one of the largest too. As with any tribe that lived in war torn times, the Franks needed good fighters and the Frankish warriors were some of the most ferocious in existence. The success of the Franks is well documented and can be largely attributed to their tribe size and their strength in numbers. The Franks were formed from an alliance between several smaller Germanic groups and grew as we mentioned earlier, into possibly the biggest Germanic group of the time. The Frank warriors among them were the ones that fought for their safety and honour, protection and allowed them to grow into a dominant position. Throughout time, the Franks and their warriors, grew and changed, moving more and more towards a more civilised existence, with social structures and politics. Even in these more civilised times, their warriors were still needed, it not more after they established themselves as a dominant force in western Europe. The Frank warrior would eventually end up with some of the finest weaponry to ever grace a Germanic warrior. With the mixing with the Romans, the Frank warrior would amass an excellent array of weaponry before battle. Their weapons would including the typical Germanic spear as the go to weapon of choice, and the Frank spear was sometimes refereed to as an Angon, and was essentially a short spear, suitable for short distance throws like a javelin, and close quarter attacks. Alongside the spear your typical Frank warrior would also carry a sword, and a knife for close quarters attacks when the spear was too long to wield effectively. Another favourite weapon of the Franks was a short axe, it’s reported that the Frank warriors were adapt as not only using the axe as a melee weapon, but also as a projectile. The Franks would launch the arrow at their foe just out of close quarter range and with the power of the throw, could split their foes shield in half, causing mortal damage if the axe head struck clean. Again the Frank warrior’s armour was among the best of the time, with breast plates, chain mail and advanced helmets more common than in many of the Germanic tribes of the time. This doesn’t change the fact that many Frank warriors did not have full equipment, and many would have fought without helmets. 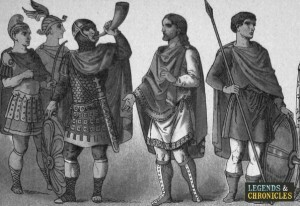 Later in the history of the Franks, particular during the Merovingian dynasty period, saw the Franks become much better equipped, chain mail, helmets and greaves were all common for the typical Frank warrior. While the Franks may have begun their existence as a more vagabond group of individuals, they would grow and evolve over time and centuries into a tightly honed but huge community. Their battle tactics and military tactics were part of the reason the Franks were able to grow so large, alongside with the skill of their individual warriors. The Franks learned a lot from their times with the Romans, their military tactics brought in many tactics the Romans used effectively and there was no reason not to follow this path. The Franks would look for locations of strength and fortification that they could effectively capture, overrun and eventually own. The power and battle savvy skills of the early Germanic Frank warriors, and the learned skill and battle tactics of the Romans, made the Franks a formidable force. Their skill with the axe, the common Germanic spear and shield, and above all their bravery made the many warriors of the Franks some of the most powerful of their time.